Skyhunter Exploration is a Calgary company working to change the way early stage petroleum exploration is done. Using their proprietary technology they conduct airborne surveys to detect trace amounts of hydrocarbons in the air. These trace hydrocarbons, called microseeps, can then be mapped and used to evaluate prospective petroleum reservoirs. Used together with other forms of geological information, such as topographical subsurface maps and seismic imagery, it’s possible to get a much clearly picture of where oil and gas can be found. The approach for evaluating a potential reservoir involves close collaboration with a cross disciplinary team. This team can be composed of geophysicists, geologists, reservoir engineers and landmen, all with different knowledge and data to present. This can be a complicated process and it’s made more difficult by using inferior systems. 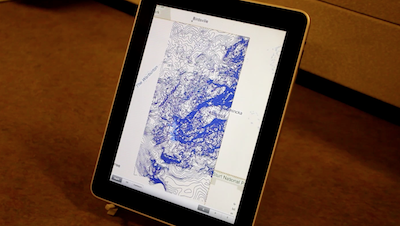 A multitouch tabletop can be uniquely beneficial in this situation, allowing users to work with different data types and in a natural collaborative way. Our research goal is to create such a system, that incorporates various data sources, including microseep data, subsurface maps and seismic imaging, into a collaborative multitouch and multisurface environment. To create such a system we have developed a standalone iPad application for mobile analysis, a tabletop application for collaborative work and an application using a wall sized display with natural gestures. Work continues as we refine and expand these systems.